Champagne is a traditional province of France, located just to the northeast of Paris. 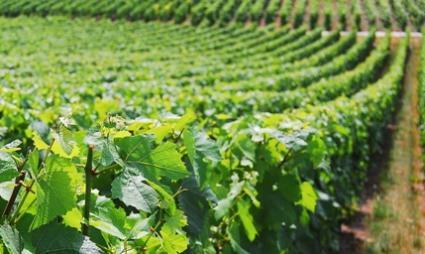 The region is best known for its vineyards and for the sparkling wine that bears it name. That effervescent wine, which to be called Champagne can only be produced within the province, was first produced around 1700. Contrary to popular belief, it was not the Benedictine monk, Dom Perignon, who invented the sparkling wine, but he did advance the technology and it was he who created the unique cage and cork closure that we still associate with Champagne. 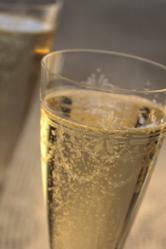 Champagne, however, is more than just wine, even so delightful a wine as Champagne. It is the traditional site of royal coronations, dating back to the days of the Frankish King, Clovis, who was crowned there in 496 AD. Once a part of the Roman Empire, the region still contains remnants of that civilization's many buildings and monuments. The Marne Valley, which runs through the province, was a strategic location during both the first and second World Wars, and the city of Reims, in particular, was heavily damaged in both wars. It was in Reims thatGeneral Eisenhower accepted Germany's unconditional surrender on May 7, 1945. The province, today, is home to approximately 400,000 residents. Over the centuries, the region has been the home of many notable Frenchmen, including Jean-Baptiste Colbert, finance minister to Louis XIV; Jean-Baptiste de la Salle, Catholic saint and noted 17th century educator; and Jean Baudrillard, contemporary philosopher. Reims is the traditional capital and the largest city in Champagne. It was here, at the Cathedral Notre Dame de Reims, that the French kings were crowned, from the early Frankish King, Clovis to Louis XVI. It was to Reims that the teenage Joan of Arc brought the exiled French King Charles VII to be crowned, thus launching the French defeat of the British. Reims is a lovely town that lies along the banks of the Vesle River, a tributary of the Marne. Medieval architecture and spacious town squares make this picturesque town a delight to explore on foot. Just at the edge of town is the Roman Porte de Mars, a triumphal arch, thought to have been built in the 3rd or 4th century. The town is surrounded by rolling foothills covered with rows and rows of grape vines. Epernay, just southwest of Reims, lies along the banks of the Marne River. This small town is the world's Champagne capital and home to some of the most recognizable names in wine, such as Veuve Cliquot, Tattinger, Perrier Jouet, and Moet et Chandon. Most of these purveyors line the aptly named Avenue de Champagne in the center of town. Underneath Epernay lies over 120 kilometers of tunnels, called caves, carved out of the region's chalky soil. These cellars hold over 200 million bottles of the effervescent wine, just waiting to come into their prime. Visitors to Epernay and the Champagne region may sample the latest sparkling wine production at small tasting rooms, many of which are located along the Avenue de Champagne. Unlike similar facilities in California, most of the French wine makers charge at least a nominal fee for tastings. Some of the tasting rooms include gift shops, factory tours, picnic areas, and restaurants. Some wineries are available only by appointment. If you have your heart set on seeing a particular vintner, it is wise to correspond with them before arriving in France. Please note that it is considered good etiquette to purchase wine from any vineyard with whom you make a special appointment. The region is easily reached by car or train from Paris. It's a relatively short time - a little over one hour by train. Once in Champagne, a rental car is a good idea, as the picturesque countryside is part of the region's appeal. Make sure, however, that you designate a non-drinking driver when you sample the province's wines. Accommodations in the province run the gamut from humble bed and breakfast inns to the renowned Chateau Boyer Les Crayeres, a luxurious mansion hotel just outside of Reims, which is also home to one of France's best restaurants.